There is no denying the incredible power music has on our emotional state and well-being. When I was in the hospital giving birth to my daughter, my focal point was music. It was the one thing that kept me grounded and calm at a scary and uncertain time. As a parent, I have seen the way my daughter’s mood and focus shifts whether we are singing, playing music or simply listening to it in the background. Because of music, we have laughed like crazy, found our own rhythm, learned incredible facts, and been sweetly soothed during unsettled (and overtired) moments. This idea of how music can put words to our emotions has prompted me to start a series that features different musicians sharing personal experiences about albums or songs that serve(d) as a source of healing. 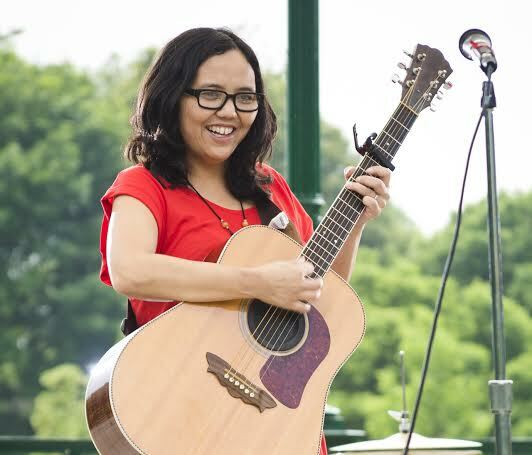 Kicking off the series is Ann Torralba, aka Little Miss Ann, who shares personal, touching words about how creating music and playing for families gave her strength when faced with an unexpected diagnosis. Read on and make sure to listen to Follow Me, a joyful, uplifting album that was created throughout Ann’s time of recovery. I consider myself very lucky. This year, I’ve been doing lots of great kids shows all over the U.S., including Brooklyn, New York, Washington D.C., Madison, Wisconsin and Chicago. I made a fourth kids CD that was funded by Kickstarter, and I’ve got a great 13-year-old daughter, supportive husband and awesome band. But that’s not why I consider myself lucky. Last year, I had a bad year. I was diagnosed with uterine cancer. Yeah, so you can see why it was a bad year. But, I survived it, and now I’m having a good year! I know I survived it because I had great doctors and nurses, an amazing community and family, and modern medicine, but there is one last important element that I believe helped me to heal and recover. That is music. You might know about the studies that say music helps promote healing, relieves anxiety and depression, and so much more. Well, I lived it. After I received my diagnosis in early 2013, I had to spend several days in the Intensive Care Unit at the hospital. During that time, I listened to a version of the song “Bulletproof” covered by Melanie Martinez on the Voice, which was a song both my daughter and I loved when we first heard it. Fortunately, I had it downloaded on my phone and listened to it at least 50 times during my hospital stay. I just kept focusing in on the words and the music. I went on to spend the first half of 2013 in and out of hospitals. My ear buds became my best friends. I really don’t know why hospitals are always equipped with TV’s. I’ve never heard of any studies that say televisions have any medical benefits, at least not like music. Why don’t hospitals have headphones that you can plug into a music source like you can on airplanes? While I was in the hospital, my really good friend and Brooklyn children’s musician, Suzi Shelton, called me often. She told me about chakras, “centers of spiritual power on the body,” and how listening to certain musicians can stimulate the chakras that need healing. I spent hours and hours listening to this music that I thought would promote healing. A good 7-8 months were spent with a lot of uncertainty and waiting. I had to wait for my biopsy, my diagnosis, my surgery, appointments, or radiation. My doctor told me that I shouldn’t identify with being sick. She said that I should just look at the hospital as a place where I needed to get stuff done. I held onto and listened to these very wise words. I continued to perform for families. I looked forward to them, only cancelling 2-3 big ones. Although I was still doing lots of gigs, I wasn’t teaching classes and booking as many shows so I had a little more time on my hands than I was used to. I watched a movie called “Happy” which talks about characteristics that happy people have in common. One thing they mentioned is being in the “flow” or being ultra-focused on an activity. I practiced that “flow” by spending hours on Garage Band writing new songs filled with love and hope. After successfully completing a Kickstarter campaign, I went on to make my fourth kids album, Follow Me. The first song, “Someday, Some Morning, Sometime” holds the most significance for me. My friend Michelle recommended it to me as a good song to cover. The lyrics are by Woodie Guthrie and Wilco covered it on Mermaid Avenue 2. I suspect Woody wrote these words for his kids about some things he wanted to do with them one day in the future. It’s such a beautiful song. Throughout that 8-9 months of being in and out of the hospital, and throughout the 6 weeks of radiation treatment, I thought about my daughter a lot. I wanted to make sure there was a “Someday, Some Morning, Sometime” for us. I remember sitting in the hospital and wanting so badly to be able to do something as simple as taking her to school in the morning and then picking her up at the end of the day. My fans didn’t know what I had been through, but they seemed to connect with my songs on their own. When I started doing better, I was happy to do a fundraising concert for St. Jude’s Hospital and donate money to them. I believe that my own experience has motivated me to send CD’s quite often to kids that I have heard are sick in the hospital. Some people might think that the reasons I listed are not scientific enough to support the benefits of music for healing. All I know is that I feel a deep connection with music as it helped me through a really difficult time in my life. It has always brought me such happiness and joyful light even in the darkest of times. I am so grateful for this and for the opportunity to continue to play music for families. I want families to know that whether you are healthy or sick, there are so many benefits from playing and/or listening to music. 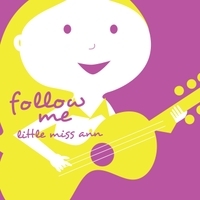 Little Miss Ann is a Chicago-based children’s musician. Connect with her at her official site, Facebook and Twitter.